Good communication beforehand, great customer service, competent and professional. Excellent as always. 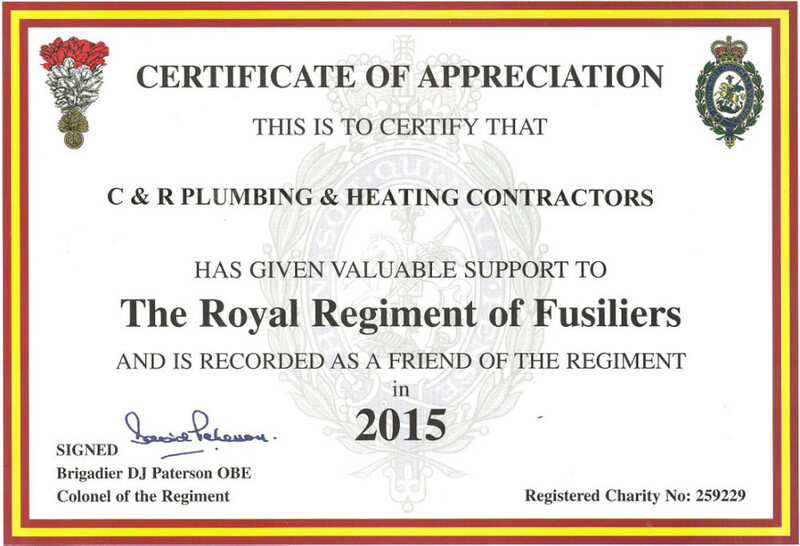 C and R Plumbing and Heating Contractors carry out annual boiler service and any other plumbing jobs I have. They are an efficient, friendly and professional company. Clean, courteous, professional, good time keeping-good follow up. As always an excellent service from Jamie and Ryan, been using them for many years. Wouldn't use anyone else. Very helpful company- work done well and cleaned up very well after job. Excellent workmanship, clean and polite. Have used before to install shower pump and was very satisfied. Very good, tidy, professional. Will use again. Top notch good quality work. Friendly, honest and helpful. Will definitely use them again and recommend to others. From the initial contact to obtain an estimate through this actual work done and price stated, this company could not be faulted. Will use again. Ryan treats your home like its his , he's clean, tidy and the work is 10 out of 10. Very friendly, helpful and nothing is too much trouble. Very happy. Very friendly family concern used them for years. Never had any problems. Very clean. Third time used and once again found them all hard working, polite and very helpful. Extremely efficient and professional job. Also very friendly and willing to accommodate. Would definitely recommend. It was very professional, they could not have done any better, will use them again. Organized and efficient work force. Very pleasant and helpful to deal with. Unexpected small leak towards end dealt with by working late and with due care. Extra redecoration dealt with, without question. Fantastic service, on time, quick, clean and friendly. Highly recommend. Exceptional workmanship, clean, tidy and very courteous. Would recommend highly. Very pleased with all aspects of work, loving the end result. They all worked very hard, cant fault them. Kitchen installer had marked space for boiler on wall and we are amazed how boiler fit to cupboard so well, shows the plumbers skills. Extremely tidy/polite. Excellent service. Will use company again on our own property and our rental properties. Highly professional throughout. They found a solution to a difficult design problem and carried out the works to a very high standard. Very friendly and polite. The few problems encountered were quickly dealt with and resolved. Excellent quality of service. Highly recommended, would use again. Excellent, they worked hard and kept me informed throughout. The work was undertaken efficiently, tidily and without disruption. Staff professional and effective. Great service once again, no hesitation in recommending this company. James was efficient and clear and the work was neat and tidy with a clear plan going forward. Friendly and polite, every detail was explained, extremely tidy, pleasure to deal with will certainly be using them again. Our boiler failed over Christmas, they came out and investigated the problem quickly. C and R were prompt to produce a quote and fitted us in during a busy period. Pipe work is tidy and gas boiler was installed with the minimum of disruption. Very happy with the workmanship, tidiness and reliability. We have found a reliable plumber now and will not hesitate to recommend them. We will be getting them back to do the first service next year. Many thanks to Jamie and Tom. Excellent service from the office staff to the engineer who came out to our property. They were all very courteous and nothing was to much to ask. Many thanks for your services. 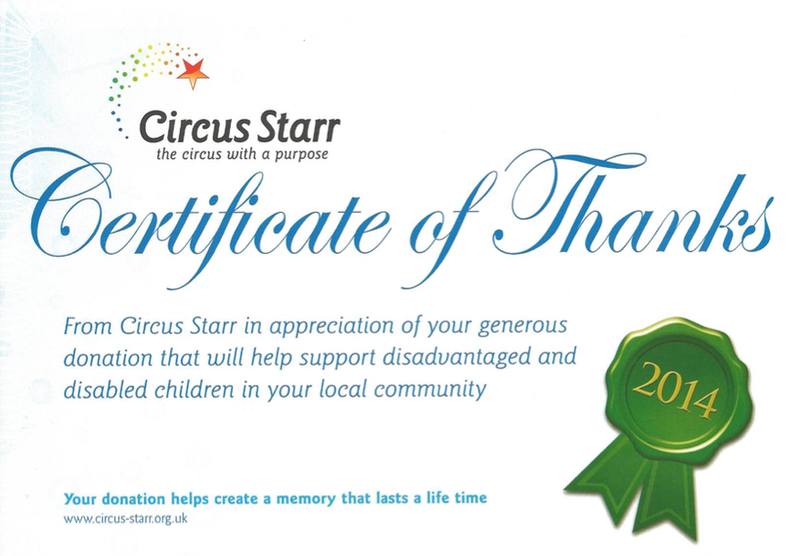 I would like to thank you all for your great service you provided to me and my family on the 06th December 2016. Your office staff were very friendly and your service engineer who came out. The faulty fan was diagnosed and replaced within 2 hrs. Myself and my family thank you all. Very satisfied with the work carried out with new boiler and the flushing of our system. Very efficient, clean and friendly engineers. Was kept informed of what they were doing, etc. And asked for permission to do things when applicable. Very impressed. Reliable, friendly but professional service, nothing was too much trouble , would recommend! Absolutely fantastic service. What was supposed to be a simple job turned into a complex job. No issues with remaining at property to fix for much longer than planned - and at a very good price. Very prompt and polite at the door before commencement of work, explained what was needed and gave advice. Friendly, helpful and very efficient, kept dust and dirt to a minimum. Very friendly and overall great service. These guys are very good at what they do. They clearly know their trade. 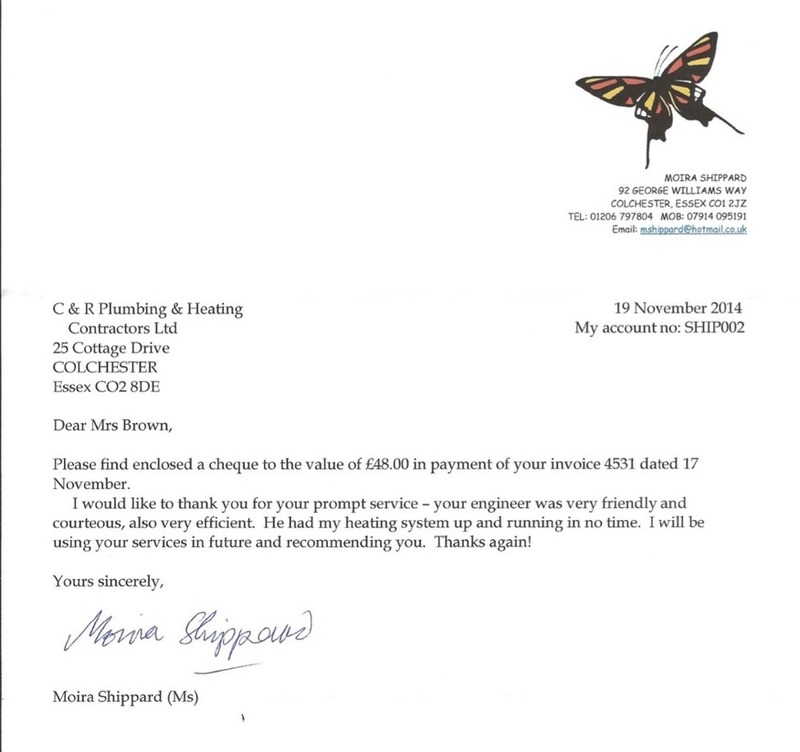 I was very impressed with the way they managed to upgrade our old heating system, keeping our disruption to a minimum, they were very polite, clean and tidy and always asked our opinion prior to fixing the boiler and radiators on to the walls. They refitted all flooring and carpets back into position with no signs that they had been lifted. They are very customer focused. I highly recommend C and R .
Clean and conscientious workers, all works very well. Technically very good. Would preferred some advance discussion and project management could improve. Very happy with their commitment to the job. They went out of the way to help me. Will use again. After contacting original installer of boiler 3 times without success called C&R. 11am service arranged for 2pm same day, completed 4pm. We were extremely satisfied and very pleased with work completed, the work done is very neat, also plumber was very tidy and left no mess. This is the second time we have used this company, and once again, very pleased and satisfied. Nice people to have in your home. Have been a customer since 2008 and have found the team to be both helpful and efficient and display good customer service skills. A very nice engineer came and sorted out the problem in the most efficient way! End to end a great service from this company. Costs were well documented and adhered to and operatives ensured a minimum of inconvenience whilst work carried out. A very professional company, we will continue to use them, trustworthy and provide a good service. Arrived in 5 minutes. Job completed in 45 minutes. Have used this company on more than one occasion. Very high standard of work, clean and tidy. Excellent job. Always use this company and have always been 100% reliable. Shower fitted ok. No problems. Work duration 1-2 hours. Professional engineer, very clean. I would recommend to all my family and friends. Brilliant, friendly , knowledgeable professional. Great job done, reasonable price. Very good service. They will be my 1st call in the future. Very neat, tidy and professional. Outstanding level of workmanship with great attention to detail. Highly recommended. I have used C&R Plumbing many times, so do my friends and family. They are very professional - polite, reliable - always ready to help, an excellent contractors. I have had this firm before, they always given me the best service. Very good professional competent , high quality. Very polite and tidy workers. Work completed in the time estimated and to a high standard. It took a little while to fit us in to there schedule but we are very happy with the work that was carried out. Very courteous and reliable company. I would recommend them to friends and family. 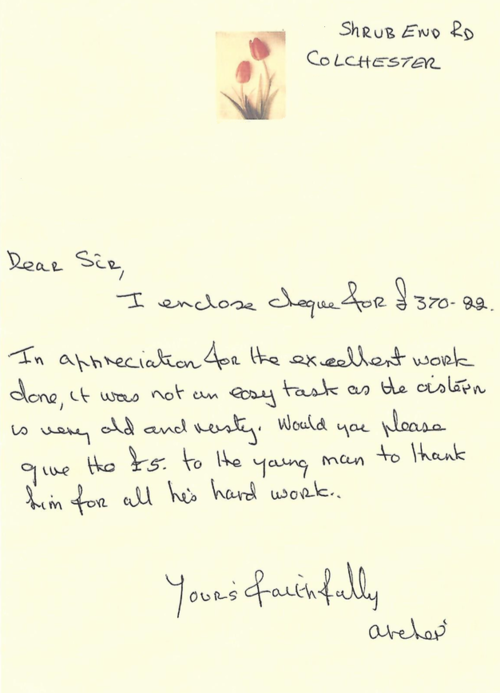 The service was excellent, the company men were friendly and professional, all work was done within their estimate. Very efficient but friendly service. Nothing was too much trouble. Would thoroughly recommend. The service given was good and he made a neat job in a tight space. Professional, efficient and polite. Time keeping second to none, even called to state running 5 minutes late! Nice to actually find someone/ company that happy to recommend and will be using again. Excellent, very knowledgeable. Really thorough job. Considerate workers. Very good explaining what he had done and what needs doing in the future. Recommended by neighbour. Very satisfied, very polite and considerate, excellent work. I have had other companies locking and working on my boilers in the past, but these guys are the best I have come across. 100% satisfied. Very pleased with service. Quick response, friendly bu professional. Would recommend. Arrived on time, completed job quickly and kept me informed, tidied up afterward. Excellent. Clear explanation, friendly, clean service. Repaired 2x toilets / replaced 6 taps / capped off waste pipe. Polite, efficient, reliable, took his wet shoes off each time he came in (his own choice), considerate, did not waste time. Very happy with service and competitive price. Very pleased with service and time spent. A trough service was undertaken. Mrs M. Herbert, June 2014. Good quality work ad service polite and friendly. 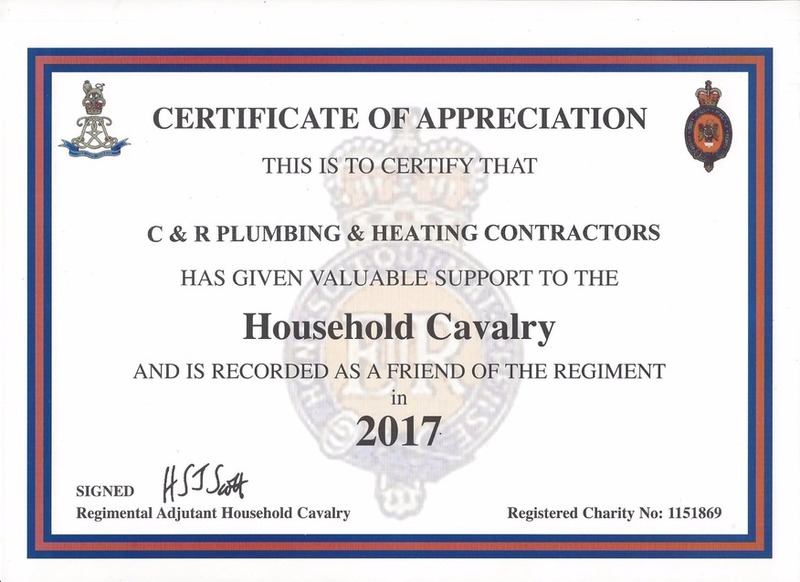 Just a quick email to ask, if in future, we can have C & R plumbing and Heating on our contractor books for all our rental/sales properties. Your contractor that quickly came out today was professional, turned up when we were told he would, and as far as we can tell, did a great job in getting the problem fixed quickly. Hestons' are new to property management and so far our standard of work sets us apart from our many competitors, we rely on professional contractors to attend to maintenance requests promptly and to high standards for our tenants and our owners. We have found good contractors are exceptionally hard to find. Very good service from initial contact to job completion. Excellent service. Came to us in an emergency and got us up and running until they could source the parts. Communicated very well at all times and I would highly recommend them. Excellent service. Quick, timely and efficient. Have used the company at work and didn't hesitate to call when I needed a plumber on the heating system at home. Plumbing work was completed as quoted, very pleased with service, would use again. Arrived on time and fitted new plastic ball and part. This stopped my overflow. Very competent and well organised project. Would use them again. Please find enclosed cheque for payment for our bathroom, We would like to thank you and Ryan for doing such a grand job. We had a picture in our minds on how it was going to look and it has turned out better than we had expected. We would recommend you to everyone on the standard of work, your punctuality and how tidy and clean you kept the house. Excellent, good, through, not rushed, things explained. Cheque enclosed, Ryan did a splendid job installing our bathroom, we are very pleased with the way your company has handled the project from start to finish. We would have no problem using you in the future or recommending you to friends and family. Polite, reliable, on time, respectful, clean, friendly. Excellent service, reliable/trustworthy and good craftsmen. Very friendly and helpful staff. Very efficient and described work being done. Estimate was spot on. Roger and his colleague turned up on time, were professional and courteous at all times and did a fantastic job. Highly recommended. 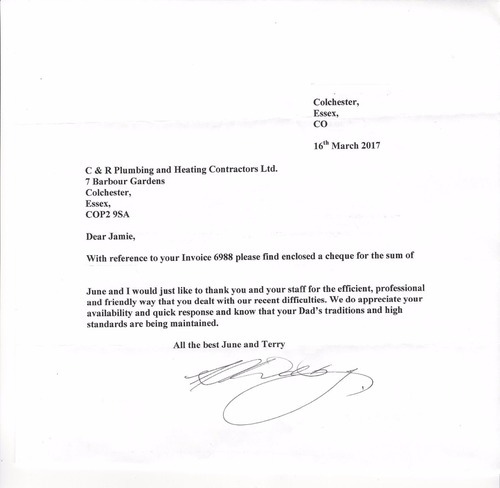 C&R Plumbing were very helpful during the planning of the work and they provided a comprehensive and timely estimate. Work was carried out within the requested timescale. 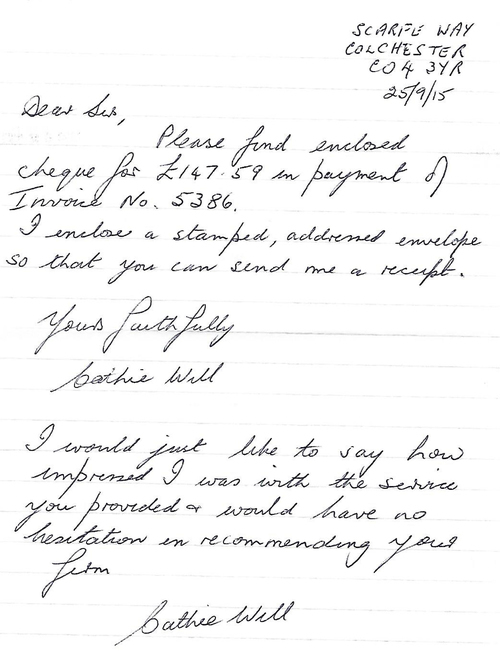 We were very pleased with the finished system and delighted with the excellent service! 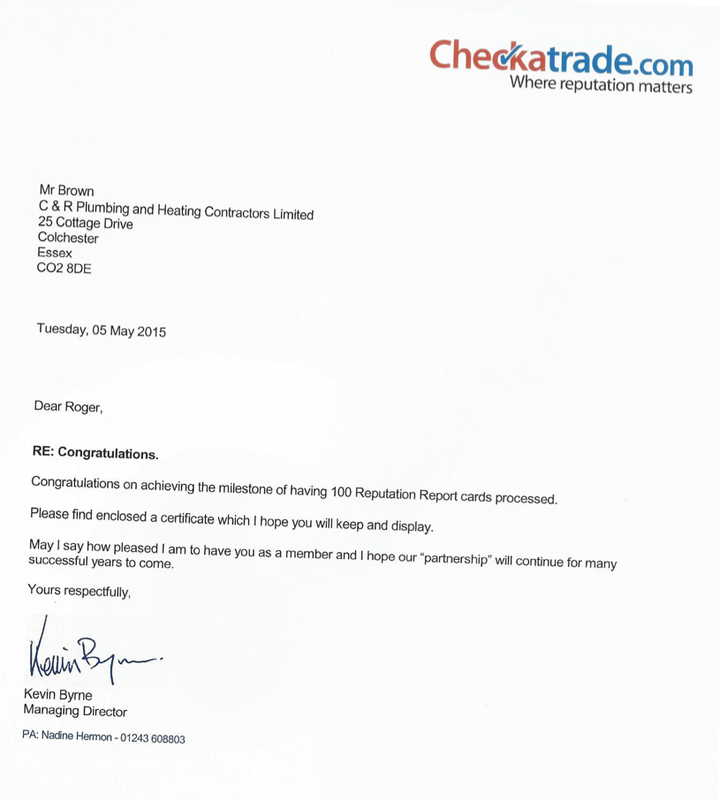 Would have no hesitation in recommending C&R Plumbing - a company that was as good if not better than it's feedback! We shall continue to use them in the future.